The Supreme Court just undercut Democrats’ chances of winning the Senate — again. On Tuesday, the bench upheld a ruling from a lower court that requires identification and proof of address to cast a ballot in North Dakota. The ruling, issued the day after Columbus Day, is expected to have an outsized impact on Native American communities in the state. Many lack both adequate identification and a standard residential address. Street addresses are not a given on reservations. Also, a disproportionate number of Native Americans in North Dakota experience homelessness. The new demands throw their right to vote into jeopardy just weeks before the midterm elections. An estimated 70,000 North Dakota residents lack sufficient ID to vote under the new law. Put another way, 20 percent of the voters likely to show up on Election Day would be barred from voting. To some, that comes as no surprise. North Dakota’s only Democratic representative by and large owes her seat to Native American voters. 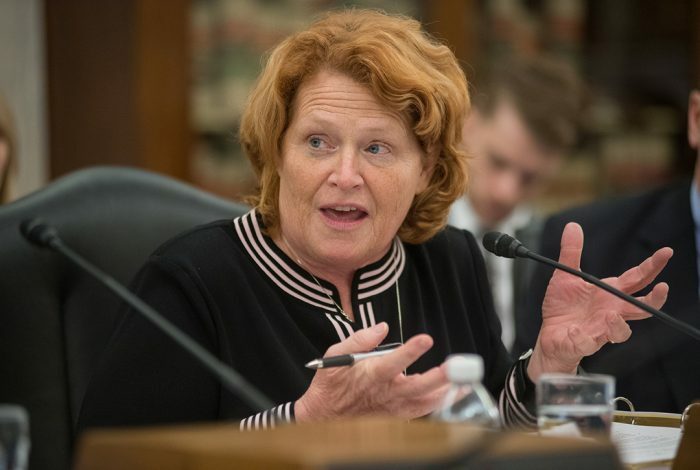 Senator Heidi Heitkamp won by a narrow margin with strong support from Native Americans in 2012: the new law could very well prevent her reelection and make it highly unlikely for Democrats to win a majority in the Senate. Native Americans living in the state filed a lawsuit against Secretary of State Alvin Jaeger after North Dakota Governor Doug Burgum signed HB 1369 to implement strict voter ID and proof of residency requirements. In April 2018, the US District Court of North Dakota heard the case. Judge Daniel L. Hovland wrote in his opinion, “This is a clear ‘legal obstacle’ inhibiting the opportunity to vote,” and would “impose a discriminatory and burdensome impact on Native Americans.” His injunction required the state to accept post office boxes as sufficient proof of residency and expand its list of acceptable forms of ID to include documents from tribal governments and agencies. Over the summer, the case went to the US Supreme Court — which this week denied the stay that lower courts had previously imposed. Now, North Dakota residents have three weeks to get their documentation in order to allow them to cast a ballot. Early voting in the state has already begun. The sudden ID requirement is likely to cause confusion and chaos at the polls. “Reasonable voters may well assume that the IDs allowing them to vote in the primary election would remain valid in the general election,” wrote Justice Ruth Bader Ginsburg in her dissenting opinion, which was joined by Justice Elena Kagan.